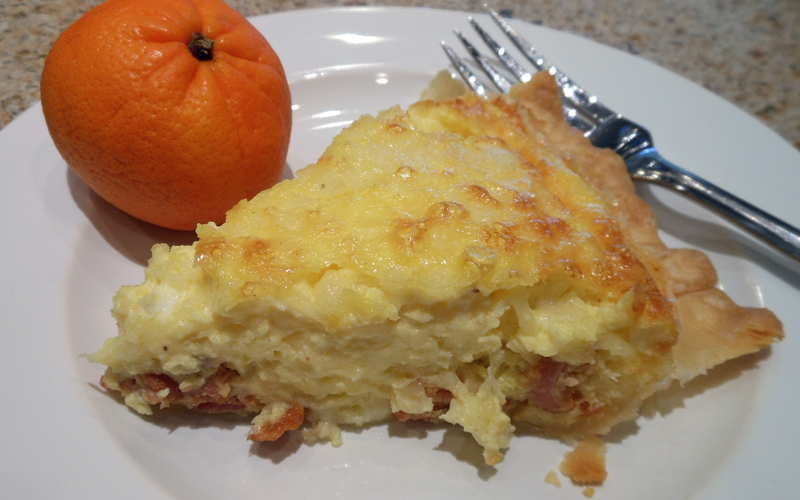 This is the most delicious quiche ever!! Line a 9-inch quiche dish or pie pan with pastry. Trim excess pastry around edges. Prick bottom and sides of pastry with a fork. Bake for 3 minutes; remove from oven, and gently prick again with a fork. Bake an additional 5 minutes. Lower oven temperature to 350 degrees. Saute bacon and onions in a skillet until browned; drain well, and sprinkle evenly in pastry shell. Top with 1 cup cheese, and set aside. Combine eggs, cream, salt, and nutmeg, stirring well. Pour mixture into pastry shell, and top with remaining 1 cup cheese. Sprinkle with additional nutmeg. Bake for 35 minutes or until set. Let stand 10 minutes and serve.